3 BR, 3 BA CONDO – DOWNTOWN BRECK – SKI-IN This spacious 3-bedroom, 3-bathroom premium condo is the ski-condo you and your family or group of up to ten guests has been dreaming of. The vaulted ceilings and large bedrooms perfectly compliment the amazing location of this condo right at the bottom of the Four O’ Clock ski run and across the street from the gondola and Downtown Breckenridge. Whether winter, spring, summer or fall, you’ll have incredible access to hiking, mountain biking and snowshoeing trails. 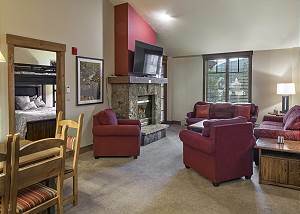 The comfortable living area centers around the stone gas fireplace and has a large LCD TV for relaxing after a long day on the slopes. Right off the living room is the balcony with views of Downtown Breckenridge. You’ll enjoy access to the shared hot tub and outdoor heated pool open year round where you can relax your muscles after a long day of adventuring. Right off the living area is the attached dining area, which offers seating for six with three more seats situated at the kitchen counter. Granite counter tops in the full kitchen provide plenty of space to cook one of your famous home-cooked meals on the nights you don’t feel like making the short walk to all of the great dining options in downtown Breckenridge. Other amenities include a washer and dryer, complimentary Wi-Fi and parking for one vehicle. If you’re looking for a spacious condo with superb access to all of the best that Breckenridge has to offer, look no further than Mountain Thunder 5402. Click or call today to book this fabulous place! SLEEPS 10: MAIN LEVEL - King master suite: large bedroom with king bed, day bed with trundle, private bathroom with walk-in shower and soaking tub, LCD TV. - Bedroom 2: queen bed with canopy twin, LCD TV. - Bathroom: tub/shower. - Twin Suite: two twin beds, private bathroom with tub/shower. - Living area: queen sleeper sofa. SPECIAL UNIT NOTES – PLEASE READ - No Pets / No Smoking. - A $500 refundable damage deposit will be charged to credit card at check in. - Renters must be a minimum of 25 years old. - Parking: 1 garage space – 1 space total. - No air conditioning. All units include at least one fan. - Business and Occupancy License #43370.